It’s a wonderful spiritual experience to travel to Tibet to see the most prominent around Lhasa including historical kings palace in the Yarlung valley which is known as the cradle of Tibetan civilization and the first ever Buddhist monastery. The holy city will greet you with the pure blue sky and impressive Potala palace perched on the red hill. You will be amazed by its prominent historical and religious sites, sacred Jokhang temple, sprawling Sera, Drepung monastery and walk shoulder to shoulder with devoted pilgrims in bustling Bakhort street during a couple of days acclimation and jet-lag alleviation. Then the spiritual journey will take you to the historical buildings and precipitous cliffs around the Yarlung valley. You can hike through the green bushes within the natural amphitheater valley and drive along the stunning turquoise color lake Yamdrok and blooming Nyenchen Kangsar glacier under the sunny plateau climate. you will never waste every single minute by discovering new experiences and wonders all the time, last but not the least, visiting Namtso lake and sleeping over on the Tashi Do promontory complete your exclusive Tibetan experience of culture, religious, natural and nomadic lifestyle. From the beginning, you will be greeted by the representatives on your arrival at the airport/train station and it is a short drive to the holy Lhasa city along the Lhasa river. Far before reaching to the city, you will have the first glimpse of tremendous Po tala Palace. Then check in in the Lhasa old town. 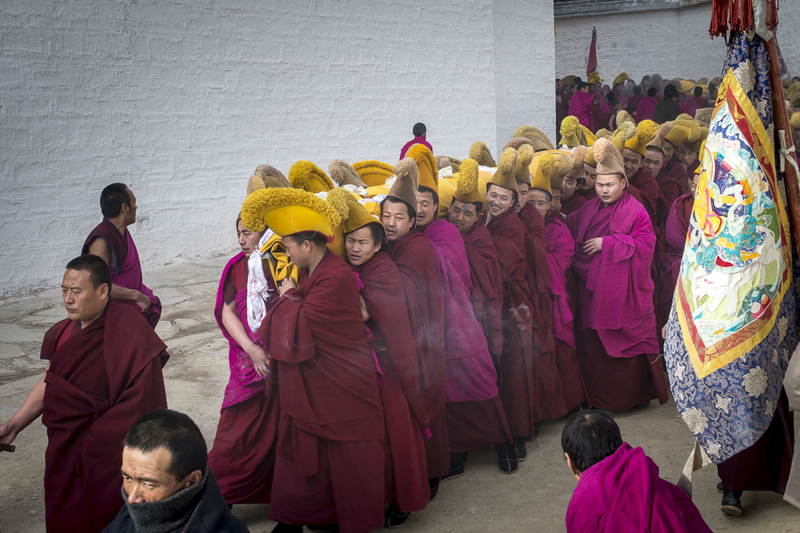 It is also known as Tibetan area that centered by mystical Jokhang temple and the bustling Bakhor street. In the following couple of days, we have thoughtfully arranged a few worthy visit to some world heritages and sites of breathing Tibetan Buddhists. You have a lot of time to walk side by side with devoted local pilgrims in the lively Bakhor street, it is also a real pleasure to explore the busy cobbled lanes twisting around the old buildings in the supernatural Drepung and Sera monastery, and the knowledgeable guides will enhance your experiences with a thorough historical and cultural explanation. Besides, we do arrange special short visit to typical Tibetan countryside family these days and even receive scared blessing from high lamas with local pilgrims per client’s interest. The next few days, we will explore the Yarlung valley which is known as the ancient Tibetan kings dynasty as Yarlung kingdom. Tsedang is the largest town in the southern part of Tibet and it is also famous as cradle of the Tibetan civilization, it was the capital of Tibet prior to Lhasa and one of the most distinguished Samye monasteries in its Mandala architecture, it was the very first Buddhist monastery in Tibet and spending a night near the monastery with full afternoon exploration around it. However, we can also start a short hiking through the solitary caves and tiny trail amidst the scrub bushes, you may get the chance to interact with devoted yogis or retreatants in their caves, up from the terrace offers a spectacular view of the Brahmaputra valley below. Then relax the day in Tsedang and take a hot bath in the hotel. At last, we will across the high peak of Shogula pass(5400m) through some peaceful villages and farmhouses within the Oyuk valley to Yanpachen and the northern grassland. There are hundreds of beautiful lakes in that vast grassland. Namtso lake, for example, is the most sacred, beautiful and the world highest saltwater lake in Tibet. We will take a night off on the Tashi Do peninsula to enjoy the breathtaking views of snow-capped ranges all around and cold breeze of the mysterious lake. Then we are going to drive back to Lhasa the other day to complete the clockwise circumambulation at Lhasa. The giant black tent which is made up of yak wool in our route has a great tendency to preserve heat and resist rain. Every single tent is a well-equipped house with kitchen, bedroom, seating room and storeroom.